One of the very best delphiniums from seed, equal in quality to expensive cutting-raised plants. 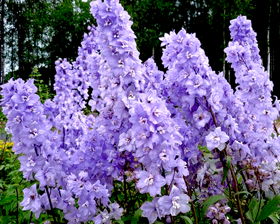 The 80-120cm tall, sturdy stems of Delphinium Blue King are covered in truly stunning delicate lilac and blue shade blooms with triple-layered petals. Flowers from June to September. Sow Delphinium seeds April to May or September to October. Sow outdoors where they are to flower. Sow 3mm deep, in rows 30cm apart. Alternatively, sow in late summer in 7.5cm pots in a cool greenhouse and then overwinter plants in cool, well lit conditions. Plant out the following spring after all risk of frost, 30cm apart in full sun.